The first meeting of Singapore’s Web Standards Group finally happened today at Raffles Girls’ School. Lucian started the meeting with an introductory presentation on web standards, while I did an introduction to web accessibility (“how to bluff your way through web accessibility”), and Nick Pan presented on the U21 Global site. 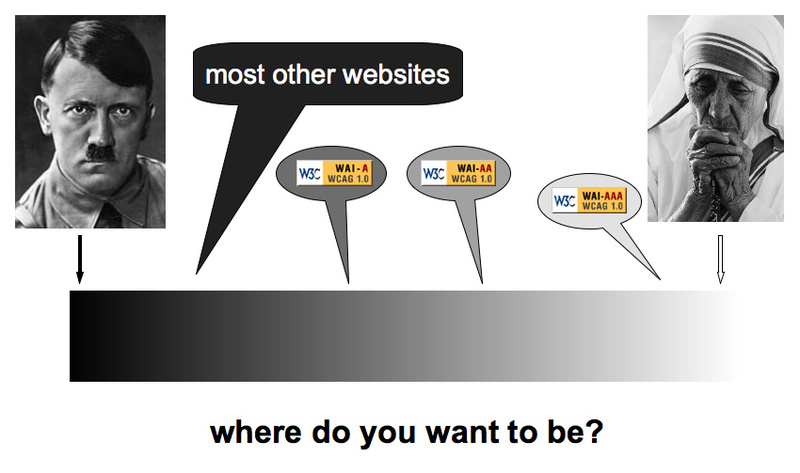 Nick also showed a very nice representation of web standards by Natalie Jost called “web standards in a nutshell“. A great session overall, finally getting to meet people I’ve encounted online for a long time (like Jimmy and Ivan Lian), and meeting other really cool people like Herryanto and Manar Hussain. And those of you who were there, let me know what you think of my presentation! And here’s the DVD example I stole from Douglas Bowman. Hey Coleman, couldn’t find your email.. Could you kindly send me the video or a link to it of your presentation? Thanks! Hey I would like a copy too, please send me! Thanks in advance!